YouTube TV is YouTube's bundled streaming television service, available for customers on the web, iOS, Android, Xbox One, Android TV, and other platforms. An app for Apple TV was initially planned for late 2017, but was delayed to Q1 2018, and now a YouTube representative speaking to CNET has teased the Apple TV app's imminent launch by stating it will be "coming very soon." Apart from Apple TV, today YouTube TV has expanded to Roku devices in time for Super Bowl LII. Taking into account the YouTube representative's comments, it appears that the company is working to launch the Apple TV app in time for some of the big live TV events this winter. So if it doesn't launch for Super Bowl LII this Sunday, February 4, there's still time for a debut during the Winter Olympic games (February 9-25) and ahead of the 90th Academy Awards (March 4). Like other versions of the app, YouTube TV on Apple TV will offer subscribers of the $35/month service the ability to stream cable television shows on ABC, CBS, Fox, NBC, CW, Disney, ESPN, FX, USA, and dozens of other major channels. YouTube TV is a competitor to similar services like Sling TV, Hulu with Live TV, DirecTV Now, and Playstation Vue, all of which can be viewed on the fourth and fifth generation Apple TV models. In addition to streaming live TV, YouTube TV includes content from the $9.99/month YouTube Red service. 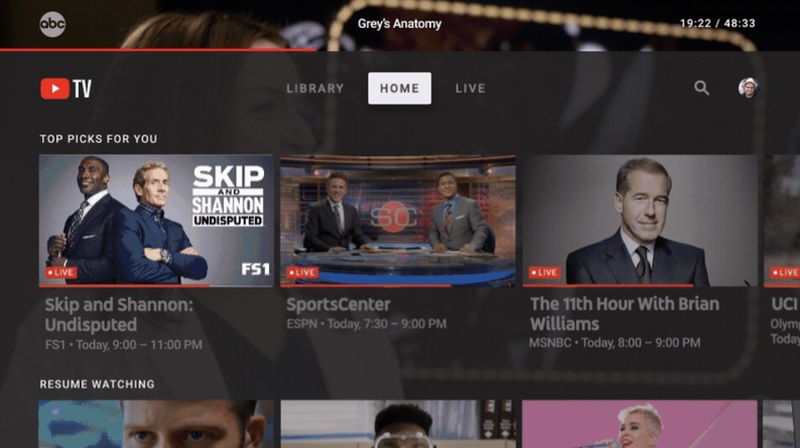 The company previously detailed the Apple TV app last October, showing that the app will have Home, Live, and Library tabs for viewing content similar to other iterations of YouTube TV. There will also be a dark background on Apple TV, a live grid-based guide to check out what's currently on TV, and a feature that keeps video running in the background while you navigate the app. They should update YouTube app with support for Apple TV 4K as well. Their current Apple TV app is abysmal. Hmm, as a cord-cutter, this still seems too expensive to justify. By the time I add this to my internet and Netflix I'm at $125 a month. Might as well just sign back up for a bundled cable package at that price. But but but for the price of just 20 cups of coffee/day you can have all these services! I came here to say that. i was debating getting the apple tv but the second i learned that the youtube app doesnt support 4k, i immediately lost all interest. I'm just glad there's a streaming service option that doesn't include FOX News so I don't have to pay for fake news. I'm definitely trying this out when they officially support the ATV. Depends on what service is available in your area and what the packages are. I recently dropped DirecTV and switched to YouTubeTV and my bill went from $119 a month to $35. I already was already paying for internet and Netflix so in my case it was a huge monthly savings and I got rid of the Genie boxes (which gave me all kinds of problems). I could probably add a basic cable package to my internet service, but I don't want contracts and I don't want cable boxes. I'm just glad there's a streaming service option that doesn't include CNN or MSNBC so I don't have to pay for fake news. I'm definitely trying this out when they officially support the ATV. Yes, it needs revamping. It's one of the reasons I don't like Apple TV. The user interface and navigating is clunky. Yes, in your case it seems to make sense. It did. I don't have as many channels but I never watched 90% of them anyway. The ones I do watch are included, aside from the History channel. But everyone has different needs and having choices is good.